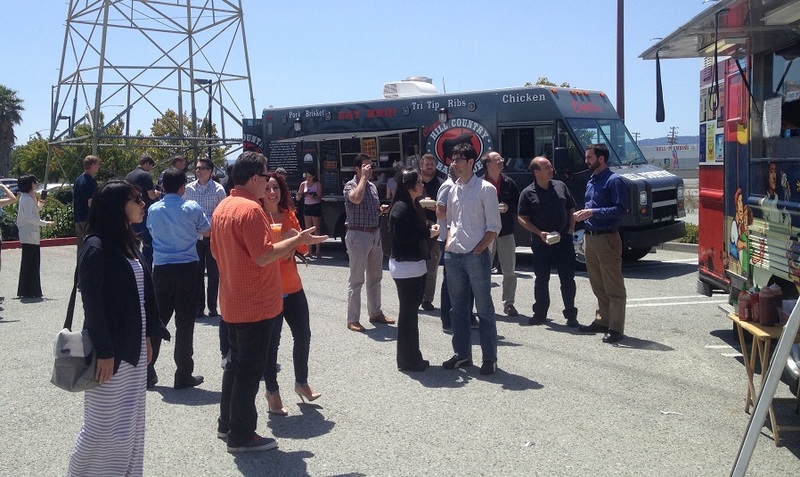 Weekly Food Truck Gathering in San Carlos Offer Food Alternatives for District Employees – Peninsula Moves! While there are plenty of places to grab a tasty bite to eat in San Carlos—as noted by ace food correspondent Hubert Chan—employees at the San Mate County Transit District do have the opportunity once a week to explore some alternatives that are a little less stationary. That’s because an array of food trucks gather every Wednesday at the Hiller Aviation Museum on the eastern side of Highway 101 in San Carlos. From barbecue fare to Vietnamese, Korean and Thai cuisines, the food trucks provide a break from the normal brick-and-mortar establishments in San Carlos. The trucks set up shop at the aviation museum for the lunchtime hours of 11 a.m. – 2 p.m., and always draw a healthy crowd of curious diners. On May 28, members of the District’s Public Affairs team took a quick jaunt over to the trucks to sample the offerings. We were not disappointed. To keep things interesting, different food trucks are shuffled into the museum parking lot every week, so patrons are constantly presented with new items to try out. On this particular Wednesday, the food truck lineup was comprised of six different operations, with Thai, Vietnamese and traditional American options all available, along with a truck specializing in frozen custard, for those with a sweet tooth. 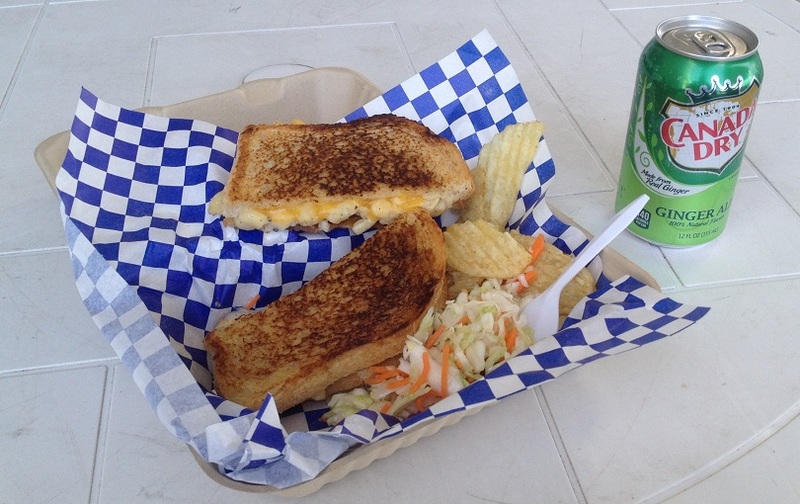 During the visit, I noshed on the Golden Gate Melt, a gourmet grilled cheese sandwich from Cheese Gone Wild. Stuffed with macaroni shells and bacon, the cheesy concoction was served up with potato chips and cole slaw. It was prepared quickly and I consumed it even faster and with much satisfaction. Social media officer Jeremy Lipps also hit up the Cheese Gone Wild truck and came way happy, although he didn’t chow down with quite as much enthusiasm as I did. Jeremy ordered the Exploratorium, a vegetarian selection that came loaded with grilled cheese and vegetables. There was speculation that Jeremy might have enjoyed his meal a touch more, if, like mine, it came outfitted with gobs of bacon. Casey Fromson, a government relations officer with the District, opted to test out the yellow chicken curry plate from the House of Siam, a dish with a slightly more adult appeal than those eaten by her male co-workers, who have the palettes of teenage boys. The chicken was doused with curry sauce and served on a bed of rice, and Casey gave the presentation strong reviews, although Sriracha sauce was applied liberally to add a little kick to the dish. Community relations officer Tasha Bartholomew, the only District staffer who had prior experience with the food trucks, had a garlic noodle dish from Little Green Cyclo, a company specializing in Vietnamese cuisine. Tasha said the noodles in her dish were a little sticky, and didn’t quite live up to her expectations. Like Casey, she also didn’t shy away from applying Sriracha to the meal, although both staffers conceded their use of the hot sauce could be attributed to personal preference, and should not be viewed as an indictment of their dishes overall flavor compositions. In summary, the offerings at the aviation museum were received warmly by the group. With a new lineup being rotated in frequently, it was agreed that the food trucks were definitely worth a trip back (or two or three or four).